What is Feline Greenies SmartBites? Nutritious Feline Greenies SmartBites are bite-sized treats for your cat that aren't just full of empty calories. 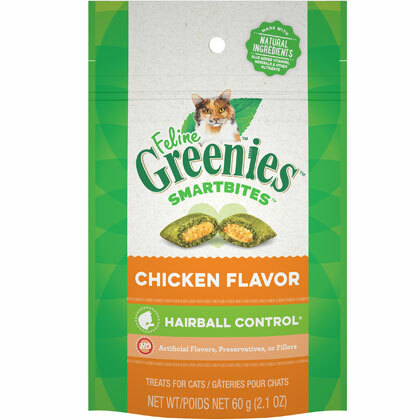 Made from natural ingredients, Greenies SmartBites are easily digestible, and designed by veterinarians to deliver real health benefits in an irresistible tasty treat. They are available in two different formulations: Hairball Control and Healthy Skin & Fur. Formulated to be enjoyable as well as healthy, the dual-textured treats are crunchy on the outside and creamy in the center with a delicious chicken flavor most cats love. Hairball Control - Fiber is essential to help minimize hairball formation in your cat's digestive tract. SmartBites Hairball Control is made with plant-based fibers to help control hairballs. Available in chicken flavor. Healthy Skin & Fur Contains fish oil, which is a natural source of omega 3 fatty acids, and flaxseed both nourishes the skin and promotes healthy skin and coat. Available in chicken flavor. Always monitor your pet while feeding a treat. Make sure there is always fresh drinking water available. 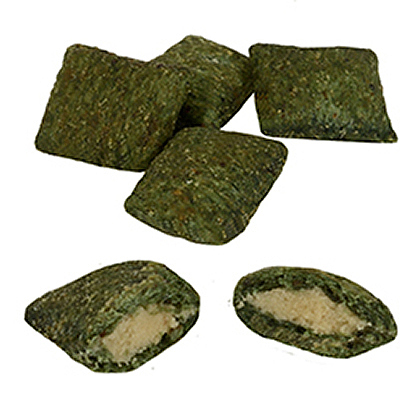 Feline Greenies SmartBites can be given as a snack or treat in conjunction with your cat's regular diet. 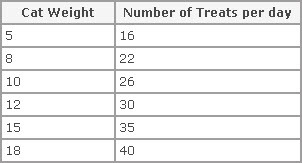 As with any treat, adjust main meal amounts to compensate for additional calories. It is okay to give your cat more than one treat at a time. For optimal benefit, follow the recommended guidelines based on your cat's weight. Ingredients: Each treat contains 25 mg of Petrolatum.Other Ingredients:Chicken Meal, Brewers Rice, Whole Wheat, Animal Plasma, Animal Fat (preserved with mixed Tocopherols), Wheat Flour, Natural Flavor, Cellulose Fiber, Brewers Dried Yeast, Dried Plain Beet Pulp, Minerals (Dicalcium Phosphate, Potassium Chloride, Salt, Calcium Carbonate, Zinc Sulfate, Copper Sulfate, Manganese Sulfate, Potassium Iodide), Vitamins (dl-Alpha Tocopherol Acetate [source of Vitamin E], Vitamin A Supplement, Niacin Supplement, Vitamin B12 Supplement, Riboflavin Supplement [Vitamin B2], Thiamine Mononitrate [Vitamin B1], d-Calcium Pantothenate [Vitamin B5], Vitamin D3 Supplement, Biotin, Pyridoxine Hydrochloride [Vitamin B6], Folic Acid Supplement), Sodium Copper Chlorophyllin, Choline Chloride, Taurine, DL-Methionine, Preserved with mixed Tocopherols. Ingredients: Chicken Meal, Brewers Rice, Animal Fat (preserved with mixed Tocopherols), Ground Whole Wheat, Animal Plasma, Wheat Flour, Fish Oil, Natural Flavors, Grain Distillers Dried Yeast, Minerals (Dicalcium Phosphate, Potassium Chloride, Salt, Calcium Carbonate, Zinc Sulfate, Copper Sulfate, Manganese Sulfate, Potassium Iodide), Ground Flaxseed, Fruit Juice Color, choline Chloride, Taurine, DL-Methionine, Vitamins (dl-Alpha Tocopherol Acetate [source of Vitamin E], Vitamin A Supplement, Niacin Supplement, Vitamin B12 Supplement, Riboflavin Supplement [Vitamin B2], Thiamine Mononitrate [Vitamin B1], d-Calcium Pantothenate [Vitamin B5], Vitamin D3 Supplement, Biotin, Pyridoxine Hydrochloride [Vitamin B6], Folic Acid), Mixed Tocopherols (preservative), Turmeric Color.